If you want something done, do it yourself! That is the only way you can be sure of its quality and the way it is done. We are referring to food and drinks here, or more precisely to yogurt. We are all aware that yogurt can be beneficial if consumed on a regular basis as it contains a lot of good bacteria that can help your digestive system. Moreover, yogurt can be good for your entire body. Instead of buying yogurt from a shop where there is a chance that it’s not fresh or tasty, and the ingredients cant be guaranteed, you can make it yourself in the comfort of your home. There are a variety of makers you can choose from depending on your preferences. In this article we will focus on one particular type of yogurt makers and that is the one that has a temperature control. It is difficult to find a yogurt maker that has a temperature control option. Most of the makers only make the yogurt. Some have a cooling mode but very few have a real temperature control. In the research we have made we were able to find one that complies with our requirements. One of the best yogurt makers on the market full stop, the fact that this offers a cooling mode puts it at a big advantage to many of its competitors and even the rest of the Cuisinart range. Sometimes when the process ends these yogurt makers can continue to cook the yogurt with the residual heat left in the machine. For the ultimate in control this is the one for you. It also offers a huge capacity and is one of the easiest to use yogurt makers out there, as well as being sturdily built and being finished with a classy stainless steel look which is sure to suit any kitchen. The CYM-100 comes with our top recommendation. 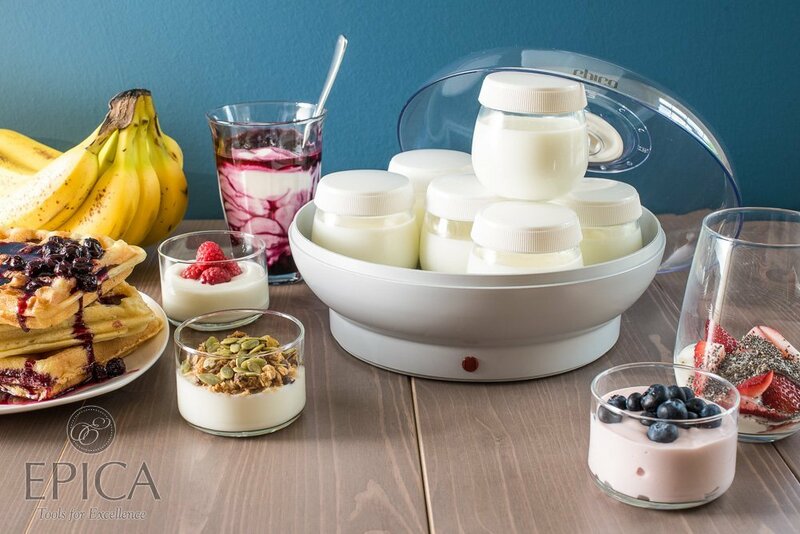 Start Set Yogurutia is another option which has true temperature control throughout the whole process – a small and practical yogurt maker that doesn’t take too much space and at the same time produces tasty yogurt. This is a Japanese product and although the two buttons are marked in Japanese it’s not a science fiction understanding what they mean. The left button on the maker is to turn on/off the maker. The button on the right is the one that we are interested in the most. That button allows you to adjust the temperature for fermentation. For those people who use the maker to make regular yogurt this won’t mean much. However for those that tend to make different types of products that require a certain temperature for fermentation this maker would be the best thing they have owned. The maker comes with a tub body with a lid and a spoon that goes inside the maker. To make your drink you just need to put in the desired ingredients inside the tub body, close it and put into the maker. Close it again and set you preferences. The good thing about this maker is that the ingredients don’t have to be pre-cooked. That means that the milk (or whatever else you are using) doesn’t have to be heated prior to the process. This maker can be bought for an affordable price having in mind the possibilities it offers. With this maker you will not only be able to make yogurt, but you will also be able to make caspian sea yogurt, natto or other things you like consuming. This can be your next favourite kitchen appliance! This entry was posted in Cuisinart. Many people choose to live their life in harmony with the nature. That means that they refuse to eat products which originate from animals. Some might find it hard to give up the tasty food they are so used to eating. But isn’t better if we try and find adequate substitution for them? Everything that you consume from animal origin can find its equivalent in the vegan menu. One of those things is the regular yogurt and the non-dairy yogurt. There are of course other, dietary reasons that some people cannot consume milk and therefore can’t make their own yogurt from it to consume at home. Non-dairy yogurt can be made from non-dairy milk. It can be milk derived from legume, nut, seed, grain, or coconut. This milk can be found in many shops or you can make it yourself. Same goes for the yogurt. However, it is always better to make as much of the products you can at home, as you can be sure of their composition. Making yogurt at home can be very easy if you have the right yogurt maker. We will present you the features of two of the best yogurt makers. Euro Cuisine YM80 Yogurt Maker is a practical yogurt maker that can help you prepare your favourite yogurt any time you want. It has a small and round shape which can fit up to seven glass containers. The idea of the glass containers is to enable you to make different flavours at the same time. If you only want to make one flavour you can use a bigger container to make a larger quantity. The entire process of making the yogurt last between 6-8 hours. The maker has a timer which indicates how far the process is, and a switch button to turn on/off the unit. In addition it has a light that indicates when the unit is working. The glass jars can be washed in the dishwasher which makes this maker easy for cleaning and maintenance. Epica Homemade Organic “Set and Go” is a perfect little appliance for everybody who has no previous experience in making yogurt. It is so easy to use, you will be amazed. It comes with a manual that shows you delicious fast recipes that can give you many ideas on how to experiment and make new flavours. It has seven glass jars that can help you make different yogurt at the same time. The final product will be thick, sweet and tart and delicious yogurts. All you have to do is put the ingredients inside the glass jar and set the timer. The optimal time for preparation of the most of the yogurts is between 6-12 hours. Leave the maker to do the job for you and come back after everything is finish to try the best yogurt you have ever had. This entry was posted in Epica, Euro Cuisine and tagged Epica, Euro Cuisine, Non-Dairy, Recipe. Sometimes the healthiest things are not the cheapest ones. In fact, healthy food has proven to be more pricy than all the junk food we are offered. However, there are ways you can save money and at the same time be able to consume proper food or drinks. This article is dedicated to those who enjoy eating yogurt. Yogurt can be store bought, but we prefer a different approach that will not only save you money but it will ensure you that the yogurt you are consuming is healthy and fresh. Making yogurt at home can save you money anyway, but even more so if you purchase a cheap machine to make it in in the first place. The only way you can be sure of what goes into your yogurt is if you make it yourself. Take a look at the two yogurt makers we have chosen for you which are cheap and make good yogurt. 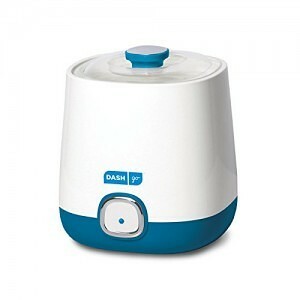 Dash Yogurt Maker is a compact appliance that can be very practical and help you in your mission to make the best yogurt and save money. It is very small so if you are struggling to find enough space for you appliances you won’t have that issue with this maker. It is one piece maker so you don’t have to worry about assembling or disassembling the parts. The container comes with a lid that makes the storage even easier. It can fit up to 1 quart which is enough quantity to satisfy your daily needs of yogurt. Moreover it is very easy to use. All you have to do is put the ingredients inside the makers and close the lid. Then turn on the button and leave the maker to do its work. After 8-12 hours depending on your recipe, turn it off and the yogurt is good to go. Another very affordable yogurt maker is Euro Cuisine YM80. It works on a different principle form the previous model you have seen. This maker consists of seven separate jars that allow you to make different flavours at the same time. The process is very easy. The ingredients are placed into the different jars. If you are making only one flavour you can buy additional bigger container. Once you put in the ingredients, you close the lids, and just turn on the button. A light should be lid showing you that the maker has started working. In addition on the side of the maker you have a timer which allows you to see the time when the yogurt will be ready. Once you finish using the maker clean it well and prepare it for the next use. All jars can be washed in the dishwasher. While many people just go for any kind of yogurt starter, it is a very good idea to go for some known names that have been making these products for years and do the job better than others. Starters are needed for the process of making yogurt, whether you’re using a crock pot or a yogurt maker or using a more old fashioned method. They come in various types with some being reusable, others made with dairy free products etc.. So without wasting any more time, let’s look at some of the best yogurt starters, otherwise known as yogurt cultures, you can buy. Euro-Cuisine claims this starter works better when combined with a Euro-Cuisine yogurt maker. But from the looks of it, it is a move aimed at push more sells of their yogurt makers as the yogurt starter works fine with any yogurt maker. Their range is fantastic, but the starter isn’t specific to their products. And in case you have never made yogurt before, the package has easy to follow instructions at the back. Ingredients used in making this include skim milk powder, sucrose, ascorbic acid and lactic bacteria. In case the yogurt starter above does not tick all the boxes for you, then you might consider purchasing this one. It makes great yogurt every time so long as you follow the instructions. Additionally, it is known to work well with any yogurt maker. It has a total of 9 packs and each box makes 6 quarts of yogurt. But that will largely depend on the recipe you follow as you will use less/more in some situations. The ingredients used are skim milk powder, sucrose, ascorbic acid and lactic bacteria. Despite having the same ingredients as the Euro-Cuisine R11020 Yogurt Starter, many love using this making it the best-selling yogurt starter on the internet. Some studies have said that more than half of the population is intolerant to dairy products. But that should not stop those with this problem from enjoying some homemade yogurt. There are a number of yogurt starters that are aimed at such customers and one of these is from Belle and Bella. The starter works well with coconut milk, almond milk and many other types of non-dairy milk. When compared with other starters in its category, it makes more non-dairy yogurt. And as a warning, you should never try to use this with dairy milk. You will not love the result and you will start cursing the day you bought this starter. But for non-dairy, this starter will do a great job. If you are looking for non-dairy yogurt starters, here is another one that will let you enjoy some non-dairy yogurt in the comfort of your home. It is also one of the best-selling yogurt starters around. Making it even better that it gives amazing results every time. Like the previous one, it also works well with almond milk, coconut milk, soy milk and so many other types of non-dairy milk. So those on SCD diet will greatly appreciate investing in this. One thing though, it is a bit pricey when compared with other yogurt starters. But apart from that, it is an outstanding starter. The fact that many are loving it is proof enough that it is worth looking into. This entry was posted in Yogurt Making and tagged Euro-Cuisine, Starters, Yogourmet. Eating yogurt is a good way to keep your digestive system healthy and it is great for your diet (and waistline). It contains probiotics that are very useful for your entire body. However very often go to the shop and buy it instead of making more healthy, homemade yogurt. Having this in mind the companies have decided to make our life easier. There are simple and practical yogurt makers which can produce fresh yogurt in just a few hours. One of them is the EasiYo Yogurt Maker, we’ve reviewed it in some detail below to help you decide if the EasiYo is the kitchen appliance for you. 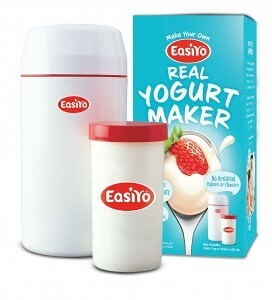 EasiYo Yogurt Maker can help you make fresh yogurt in a matter of hours without making a lot of mess in the kitchen. It is a unique system which will turn the making of yogurt as easy as making coffee. You can easily serve your guests with yogurt next time they come to visit. It has very simple design and it resembles a regular thermos. It consists of two parts. You get a yogurt jar and the actual yogurt maker. They come in two colours, white and pink and have very cute look. The parts do not contain polycarbonate, BPA or any other hormones. The best part is that they do not use electricity to make yogurt. So you don’t have to worry if you leave it over night or leave the house while you are making yogurt. In fact we encourage you to leave it. Forget about the fact that you have yogurt for the next 8 hours. Make sure to remember it after that because it will be ready for you. If you forget it for more than 24 hours than you might have to check the quality of the yogurt as we are talking about having fresh yogurt rather than a stale one. 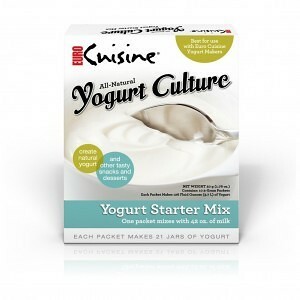 Unlike other yogurt makers where you have to pre-heat and prepare the ingredients here you don’t have to do any of that. This maker has a baffle system that controls the head and makes sure the temperature is right to activate the lactic ingredients. 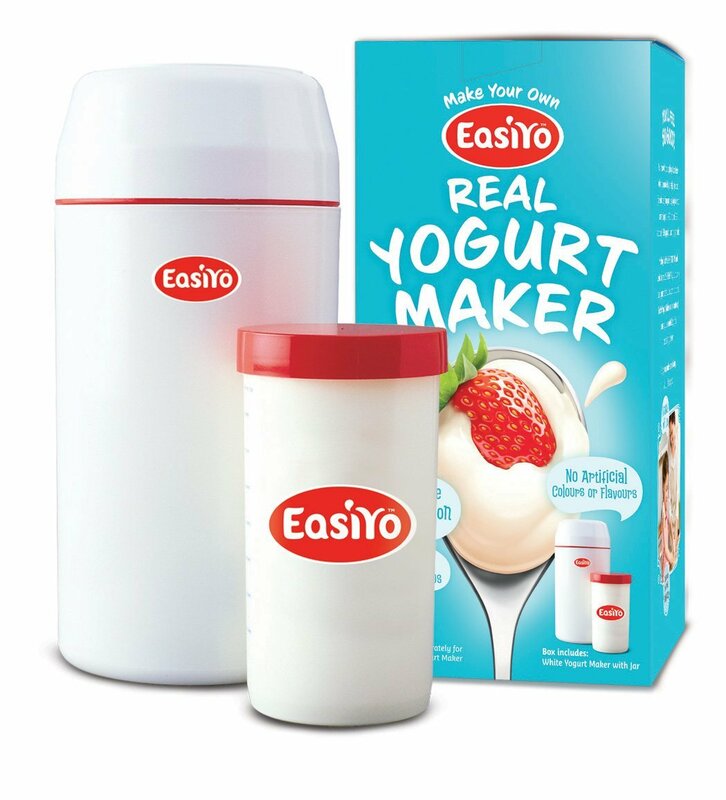 This is a real plus point and a USP for the EasiYo, making it one of the top yogurt makers for your home. This does mean it only works with EasiYo branded stater sachets and mixes, but these are easy to get hold of and it doesn’t make things difficult. In order to make your yogurt you have to follow three simple steps. First of all fill in the yogurt jar with cold tap water. Put some of the content from the EasiYo starter sachet and add sugar and other experimental ingredients if you want to. Add some more water and close the lid. Then shake everything. The second step is to pour some boiling water into the maker. Make sure you don’t cross the top of the red line. Next you need to put the jar into the maker. The baffle system will let you know how far you can go. Close the lid on the yogurt maker and your job is finished. After 6 to 8 hours you will have fresh yogurt. In summary, although there are some other models that are more automated and make use of electricity, for a non-electric version that you can use anywhere and even take out and about with you. This is a great, affordable yogurt maker for you to use with ease in the comfort of your own home. Everyone knows how beneficial it can be to consume yogurt. Yogurt contains good bacteria and probiotics which are great for your digestive system, it is healthy and good for any diet. It is easier than ever to have Yogurt on demand now, and to control what is in it, by purchasing a yogurt maker for your own home, a simple and effective appliance. 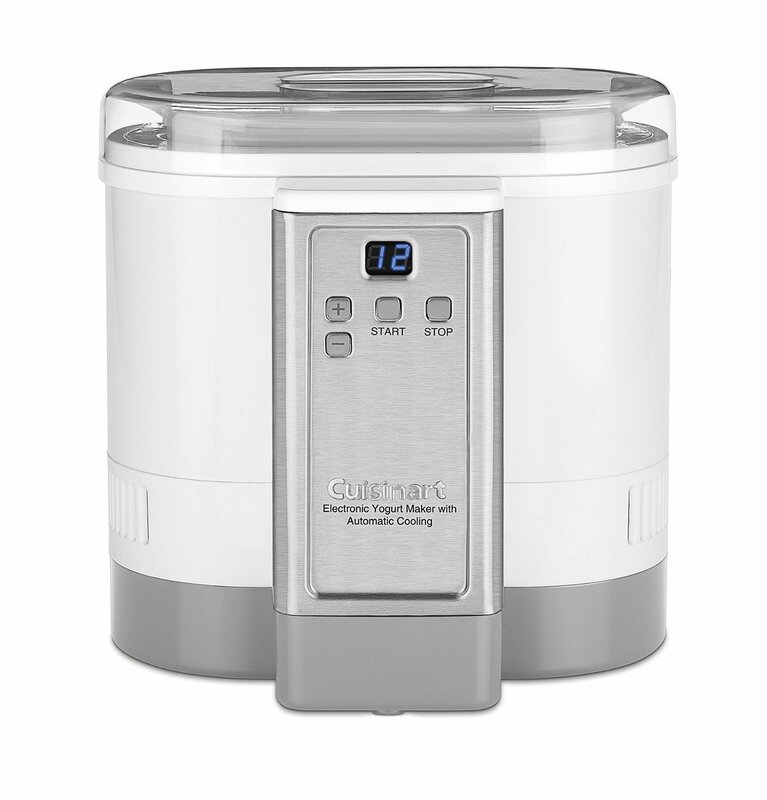 A top choice for your home is the Cuisinart CYM-100 Electronic Yogurt Maker. Cuisinart CYM-100 Electronic Yogurt Maker is a practical kitchen appliance that can make your favourite yogurt in no time. But let’s start with the basic things first. The maker consists of several parts. It has a base or a housing, control panel, yogurt container, lid for the container, another lid for the housing and you get a little scoop that goes with it. The housing is pretty big and you can make up to 50 ounces of yogurt at one time. First you need to put all the ingredients in the yogurt container and put on the matching lid. Then place the container into the base, or the housing and close the other lid as well. Plug in the maker. The default fermentation time is 8 hours. You are offered the option to increase or decrease that time depending on your preferences. Once you choose your time you can press the start button on the control panel. The maker will start the fermentation process and it will start counting the time. Cooling mode is perhaps what sets this apart from other yogurt makers and ensures no overcooking occurs due to the heat in some machines remaining after shut off. When the fermentation is finished the maker will automatically switch into cooling mode and it will stay in that mode until you turn off the maker. When you decide to turn off the maker you should hold the stop button for about three seconds. Once you turn off the maker you can remove the yogurt container from the housing. You can then place the yogurt into the refrigerator for further use or use the scope to serve the freshly made yogurt. After you make the yogurt you can play with different flavours. It is recommended that you wait 6 hours from when the cooling started before you add additional ingredients. If you decide to add fruit to your yogurt you can store it for longer time, as fruit doesn’t harm the yogurt. If you decide to add different syrup then you might want to do that on smaller portions rather than on the entire yogurt. 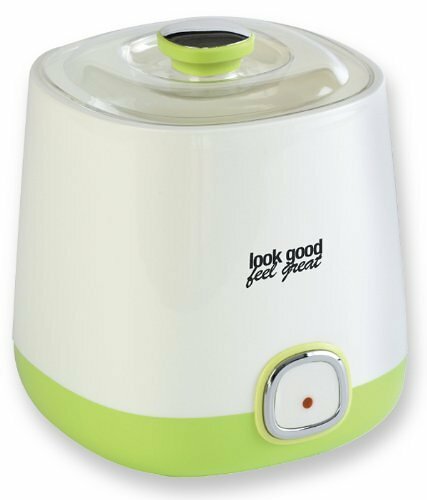 This is an excellently reviewed yogurt maker and though it costs a little more than some of the other models out there, it is seen as an elite version, offering features such as the cooling system and stainless steel housing. It is a luxury model which won’t restrict anything you want to do with your yogurt, it has a big capacity, and does the job perfectly every time. You can mix and match and create your own recipes any time you want. Once you buy this maker your opportunities are endless. This little helper will make sure you always have freshly produced yogurt that will satisfy your daily needs of probiotics and calcium. So you can be healthy and become expert in the kitchen at the same time. This entry was posted in Cuisinart and tagged Cuisinart. Everybody is looking for the yogurt making machines that can help them out in making perfect thick yogurt without much effort so that they don’t have to buy yogurt from the market that includes artificial flavors and additives. But they often get confused while selecting a yogurt maker for their kitchen as there are a variety of products available in the market and they couldn’t decide which product is best for their home. Well if you are in the position described above, don’t worry. Our site is here to guide you and help you out. I am going to tell you about a yogurt making machine that is great in every sense and is extremely affordable. I am talking about the Look Good Feel Great YM-6/2393 Yogurt Maker. This machine is great for those of us on a budget, or even those who just want to experiment with making their own homemade yogurt. Let’s take a look at the features of this great yogurt maker. The yogurt making machine helps you in making yogurt at home quite easily without any effort. As simple to use as yogurt makers get. Container has the capacity of up to 0.8 quart that is enough for making yogurt for the entire family. With this yogurt maker, you can make yogurt that can serve 2-4 people at a time. The yogurt making machine also comes with a convenient storage container. This provides you simple storage of yogurt without shifting from one container to the other. Moreover, the Look Good Feel Great yogurt maker comes with a recipe book that includes the recipes of all the delicious dishes that you can make with your yogurt created by yogurt maker. Isn’t that great? You get a lot of features in minimal price. Do you want to know what other people think about the product? Let’s take a look at other people’s thoughts and views. The customers are really satisfied with the features and the working of this yogurt maker and highly appreciate the product at the Amazon website. The product has the current rating of over 4 stars. One user has suggested that the machine works great in making yogurt in just 8 hours and you do not have to watch the yogurt so closely to make it perfectly. The yogurt making machine does all that for you in appropriate time, which frees you up to do other things. Another user has commented that she made the yogurt with powdered milk following the recipe provided with the product and the yogurt turned out to be great. The powdered milk also cuts off the warm up time as the milk was made with tap water. So it was quite quick. You can experiment with things like almond milk as well to great effect with this maker. You can get this great product for just over the $20 mark, which is pretty exceptional as it comes with lots of features and a recipe book. It is cheaper to buy a non-electric yogurt maker such as this of course, and you may find more features if you splash out and go for an electric model, but if your needs are analog then this could well be the one for you. This entry was posted in Yogurt Making.